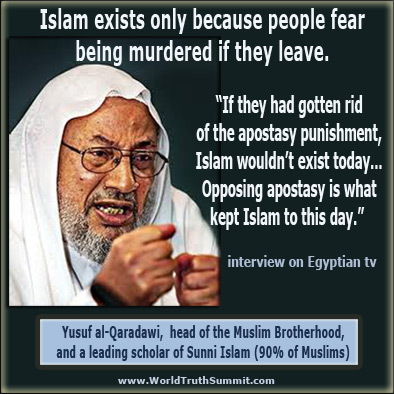 Yusuf al-Qaradawi, leading Sunni scholar, says: Death to apostates is needed, or Islam would not exist. Many Islamic texts support death to apostates. or Islam would not exist. Many Islamic texts support death to apostates. Such interesting pieces of information come into my inbox. Yesterday there was a link to a video from Yusuf al-Qaradawi, the head of the Muslim Brotherhood and a leading authority on Sunni Islam (90% of Muslims are Sunni). The broadcast came from a major television network: Egyptian national television. And it contained a very interesting message. If they had gotten rid of the apostasy punishment, Islam wouldn't exist today. Islam would have ended since the death of the prophet, peace be upon him. Opposing apostasy is what kept Islam to this day. Surah 5:33 says: "The punishment of those who wage war against Allah and His apostle is that he should be murdered or crucified. "According to Abi Kulaba's narration this verse means the apostates. This in addition to a big number of other narrations,by other companions, about apostasy. Some might say that what is most interesting is that this is a clear, unequivocal statement against freedom of religion within Islam, or at least within Sunni Islam. According to al-Qaradawi and the many Islamic religious texts he cites, Muslims have no freedom of religion. Stay, or be killed. Very informative for all of us who believe in freedom of religion - and who keep being told Islam is for this, with quotes such as "There is no compulsion in religion." Of course many of us know those passages were later abrogated - but it's great hearing this from a major Muslim authority. But a second point may be even more interesting. 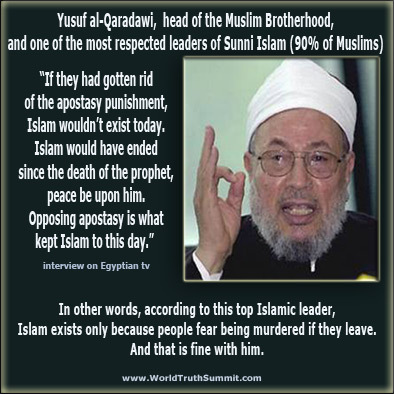 According to al-Qaradawi, the only reason Islam still exists is that the punishment for leaving is death. In other words, according to him, the religion is otherwise so unattractive, that it requires the threat of murder for apostasy to keep people within it. And it requires the actual murder of at least some of those who dare leave. There's a third point. Al-Qaradawi doesn't question the morality of killing people who leave Islam. Quite the contrary. The only thing that matters to him is backing his statements with lots of quotes from Islamic religious texts. This is a characteristic many have noted about Islam: it discourages critical thought. All that matters is: what do the texts say? The most striking thing about his statement, however, was that it was not an apology; it was a logical, proud justification for preserving the death penalty as a punishment for apostasy. Al-Qaradawi sounded matter-of-fact, indicating no moral conflict, nor even hesitation, about this policy in Islam. On the contrary, he asserted the legitimacy of Islamic laws in relying on vigilante street justice through fear, intimidation, torture and murder against any person who might dare to leave Islam. For more from Nonie Darwish, who left Islam despite the death threat, and who recognizes this was a dangerous choice, click here. Very short - about one minute and a half. Long enough for the points to be made. Death to apostates in Islam is needed, or Islam would not exist. Many many Islamic texts support death to apostates.